The '80s funksters team up with the TTC for a joint photo-op. 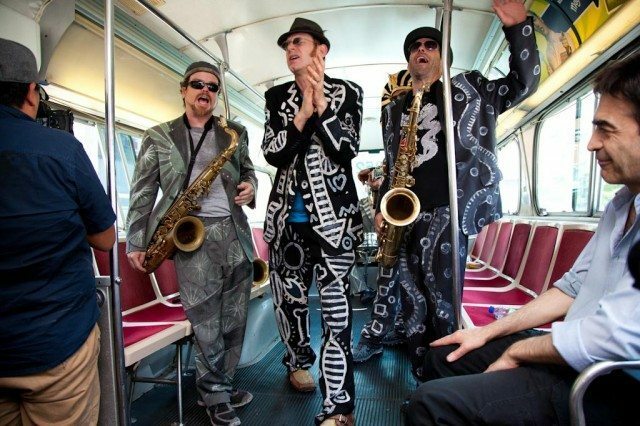 As luck would have it, the TTC’s decision to perform major construction work on Spadina Avenue’s streetcar tracks happened to coincide with a new CD release by the jazz-funk band whose weird, sax-driven homage to Spadina’s pre-streetcar transit situation made them (relatively) famous. Today, the band and the transit agency joined forces for a well-timed photo-op. The Shuffle Demons, whose 1986 single “Spadina Bus” was an unexpected hit, hadn’t released an original album in almost 20 years when word came down late last month that the TTC would be shutting down Spadina Avenue’s streetcar right-of-way until fall, in order to repair the tracks and upgrade them in preparation for the arrival of a new generation of high-tech light-rail vehicles. And what would replace the streetcars while the work was happening? The same mode of public transit that operated on the street before the tracks went into operation in 1997: the bus. At almost the same time, the Shuffle Demons began promoting a new album, Clusterfunk, which was released on July 3. By going back to buses for a few months, the TTC risks provoking the ire of drivers and transit riders, both of whom will be inconvenienced by the temporarily more-congested Spadina Avenue. The Shuffle Demons, meanwhile, have to promote a new album to a listening public that hasn’t heard from them (except at the occasional music festival) for decades. As it turns out, these are compatible public-relations problems. This afternoon, the Shuffle Demons put on a special concert on a retired TTC GM bus—similar to the kind they serenaded in their best-known song—as it drove down Spadina Avenue. They played songs from their new album. And they played “Spadina Bus,” naturally. Do you feel better about the bus now? Do you kind of love the Shuffle Demons? You’d have to be a monster not to. TTC public relations wins. A video, with photos of the performance, is above.